Ospreys coach Steve Tandy is hoping his players use the occasion of Friday's Welsh derby at Scarlets to put a dismal start to the season behind them. 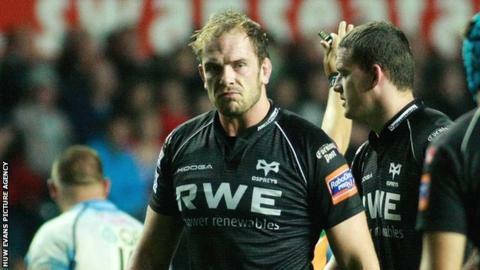 A 28-10 defeat at home to Glasgow last Friday was Ospreys' third straight Pro12 loss at the start of the season. But Tandy hopes the 21 September clash with unbeaten west Wales rivals Scarlets will provide a turning point. "We've always performed in derbies, we're a pretty proud bunch and I know that they'll be hurting," said Tandy. "So there's probably no better game for us than going down to the Scarlets and hopfully prove a point... really show that we are still a decent team, and get those basic areas of our game right. "I don't feel the pressure, I just feel the performance isn't good enough. "Probably all eyes are looking at us now after three losses on the bounce, which is not acceptable as Ospreys and it's something that we need to put right and put right quickly." An opening defeat away at Treviso - Ospreys' first loss to an Italian side - was followed by a home loss to Ulster and then another humbling at their Liberty Stadium home by Glasgow. "There were a lot of things involving our performance that were really poor," Tandy added. "We can't hide away from the fact that was a real disappointing performance in large aspects of our game - set-piece, tackle contest, basic turnovers. "You're never going to win games against a good team like Glasgow with a performance like that. "We've found out a lot in the last three games, but [against Glasgow] I'm really disappointed and to be brutally honest that's just not acceptable and good enough for us as Ospreys. "It's hard to put a finger on it but it's basic [mistakes]... and we got exactly what we deserved out of the game, which was nothing. "You look around the changing room, the coaching staff, the players, everyone is disappointed." Scarlets' start to the season, in contrast to Ospreys, has been impressive and the Parc y Scarlets side sit unbeaten at the top of the Pro12 table with victories over Leinster, Glasgow and Connacht.